Enjoy some pineapple! This fruit contains a proteolytic enzymebromelain-that digests food by breaking down protein. Bromelain also has anti-inflammatory, anti-clotting and anti-cancer properties. Studies have shown that consumption of pineapple regularly helps fight against arthritis, indigestion and worm infestation. Combine diced pineapple with chopped shrimp, grated ginger and a little olive oil. Season to taste and serve this fragrant shrimp salad on a bed of romaine lettuce. Mix diced pineapple and chili peppers for an easy to prepare salsa that’s an exceptional complement to fish such as halibut, tuna and salmon. Drizzle maple syrup on pineapple slices and broil until brown. Serve plain or with yogurt. Chopped pineapple, grated fennel and cashews go well together and are especially delicious as a side dish to chicken. Pineapple is a wonderful addition to fruit salads, especially those containing other tropical fruits such as papaya, kiwi and mango. This mellow-flavored cabbage is considered by many to be one of the best of its genre for cooking. Savoy has a loose, full head of crinkled leaves varying from dark to pale green. Choose a head that’s heavy for its size. The leaves should be crisp, not limp, and there should be no sign of browning. Refrigerate, tightly wrapped, in a plastic bag for up to 1 week. 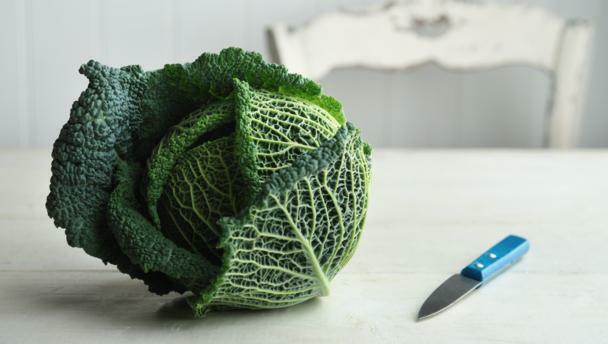 Savoy cabbage makes a quick and easy side dish when thinly sliced and sautéed with some scallions and garlic. It tastes great with pork chops, chicken, or fish. Chop scallions, reserving white and dark green parts separately. Cook scallion whites and garlic in oil in a 12-inch heavy skillet over medium-high heat, stirring occasionally, until garlic is pale golden, about 3 minutes. Stir in cabbage, 3/4 tsp salt, and 1/4 tsp pepper and sauté 1 minute. Add water and cook, tightly covered, until cabbage is wilted, about 3 minutes. Add scallion greens and cook, uncovered, stirring, until most of water has evaporated and cabbage is tender, about 2 minutes. Season with salt and pepper. Salad Niçoise is a beautiful French composed salad that looks really fancy but is incredibly easy to make. The traditional version is often made with tuna, but here it’s replaced with baked tofu, which makes a great stand-in. And the array of ingredients—white beans or chickpeas, slender green beans, tomatoes, and olives—make it a splendid main dish salad for summer meal, either for busy weeknights or for company meals. Serve with any combination of fresh corn on the cob, a crusty bread, cold soup, or grilled vegetables. Steam the green beans until they are bright green and tender-crisp. Err on the side of more less cooked rather than overcooked. Drain and rinse with cool water until they’re at room temperature. On a large serving platter or large shallow serving bowl, arrange the lettuce or greens. Arrange the green beans, tofu, tomatoes, beans or chickpeas, olives, and optional artichoke hearts and/or red onion rings in separated mounds over the lettuce or greens. Drizzle a little vinaigrette over the salad, then pass it around for everyone to dress their individual salads. Serve at once. Note: If fresh slender green beans are unavailable, use organic whole green beans, thawed and steamed just until tender-crisp.